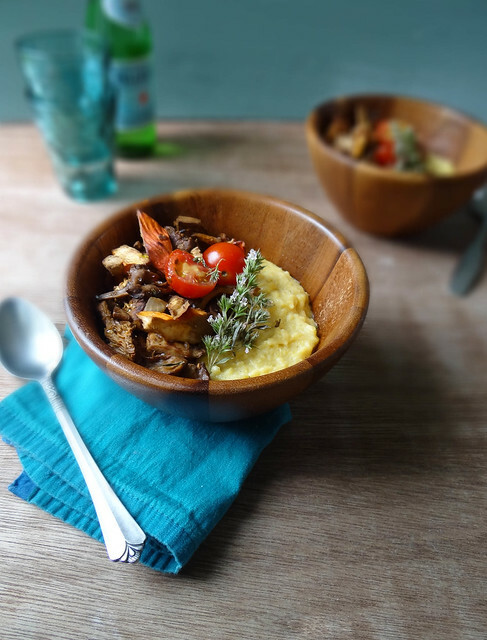 Honestly I am not sure this constitutes as traditional polenta- consider this the more rustic version of creamy polenta's cousin. 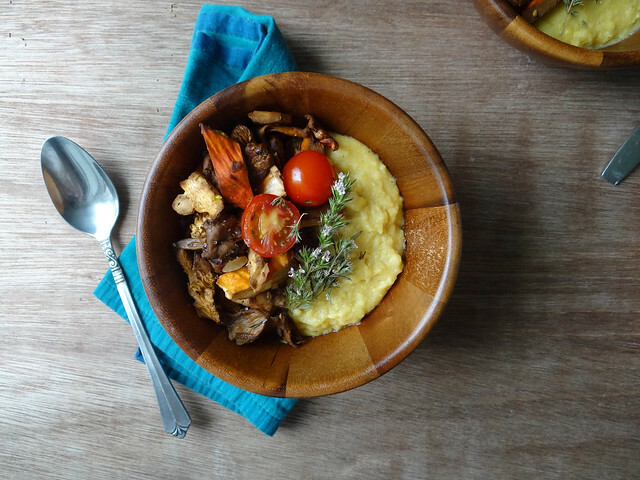 Ever since make the amazing polenta fries in VegNews I have been hooked on the idea of making a big bowl of polenta topped with wild mushrooms- well, here it is I finally got around to making it. Before my magical polenta fries experience I had only ever had polenta twice- layered in a polenta lasagna and once from the pre made polenta tubes, it was so memorable I can't even remember what I made with that tube of polenta. Tell me those are not some of the most beautiful organic wild mushrooms you ever laid eyes on. I am so grateful to have an amazing Wild Mushroom Company in my backyard, before meeting up with NH Mushroom Company the most exotic mushroom to grace my table was the shitake. 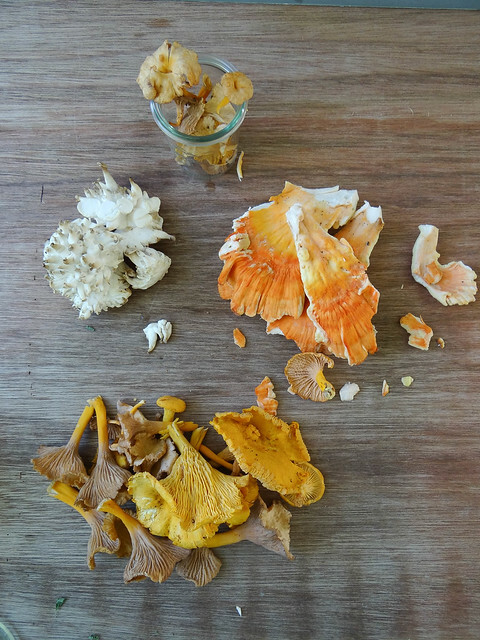 This past year I have had the opportunity to explore so many different varieties - what you see here are Chanterelle, Chicken of the Woods & King Oyster bits. 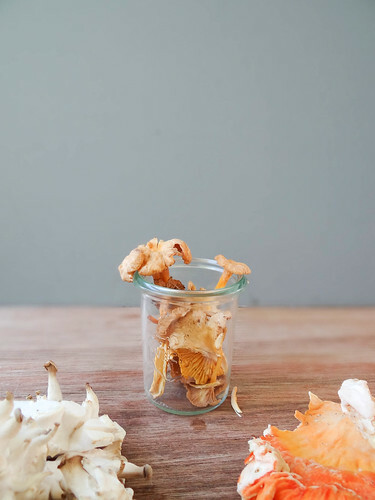 The Chicken of the woods was interesting, it definitely has a very hearty texture and feel - it was the perfect addition to the more delicate chanterelle & king oyster bits. Although Justin is a fan of mushrooms, I just knew this dish would be completely out of his comfort zone. I ended up making this for lunch on a day he was working late into the afternoon. I had saved the other bowl for dinner that night, when I set it out he gave one look and said "that's okay Hun there is way too much going on in there for me"- at times Justin can be a man of very simple tastes, other times he surprises me and ventures out of his food comfort zone - this was a little too out there; if you ask him, he is not picky at all. This time of year I find myself seeking comfort foods more often than not, I am sure it has a lot to do with the changing of the seasons in addition to the days becoming shorter and cooler. It can be a hard transition, going from bright beautiful mornings & clear warm nights to waking up in the dark and leaving for home in the dark. On the weekends all I want to do is cozy up on the couch with a steaming bowl of anything warm and equally as cozy- a sure sign for me that fall is on its way. Another sign fall is creeping in - the undeniable slow down of the garden. 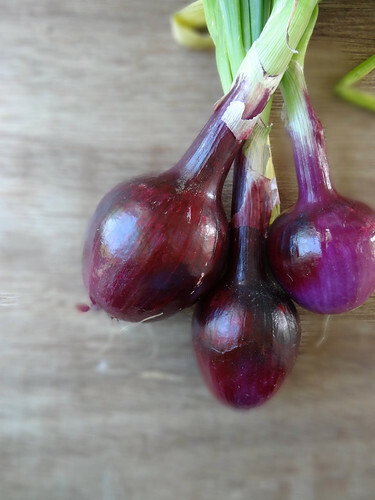 Don't get me wrong, we still have loads of veggies thriving, however summer fruits and veggies so abundant in mid July are slowly wilting away. I have a few zucchini and summer squash to pick, definitely the last ones of the summer. Over the next few weekends I will begin prepping the beds for fall and the upcoming winter season. We are still lucky to have beautiful tomatoes ripening on a daily basis, the Swiss chard and rugged Jack kale are perfectly happy and have been since the start of the season. Soon enough I will be drying herbs for winter storage and canning batches of salsa and tomato sauce that will last us well into the winter season- a nice reminder of summer to get us through the coldest months of the year. 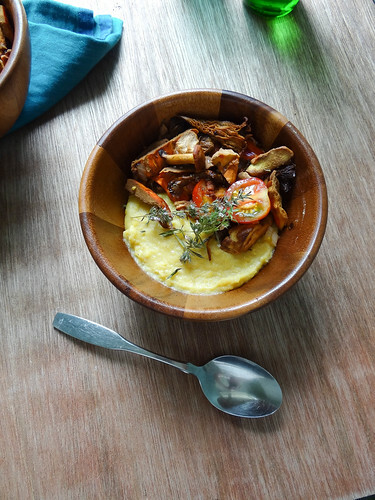 Fall comfort in a bowl - oh and in less than 20 minutes from start to finish! 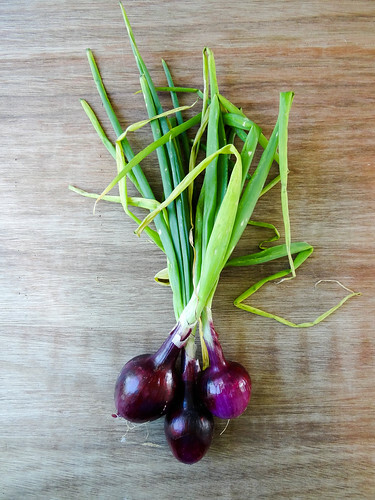 In a large skillet over medium high heat add olive oil and red onion to the pan- saute for about 3 minutes until onions are softened. Add mushrooms and saute for an additional 5 minutes, sprinkle with salt and season with a few good splashes of balsamic & thyme, continue cooking on medium high for 3-5 minutes until balsamic reduces and mushrooms are cooked through. Add cherry tomatoes to the mushrooms, stir and remove pan from heat and set aside. 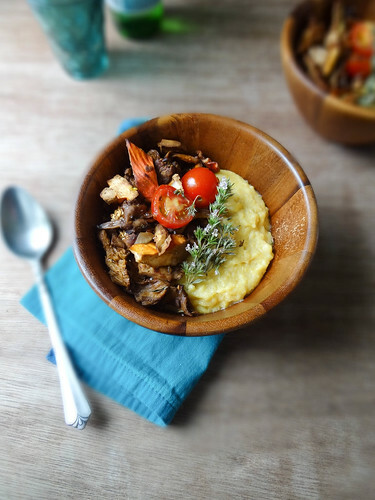 In a medium sauce pan, bring 2 cups of water to a boil, slowly whisk in polenta and reduce heat to low- add nutritional yeast and salt, continue stirring the mixture over low heat for 2-4 minutes. Remove from heat and add 1 tablespoon vegan butter & 1/2 cup non dairy milk, stir well. 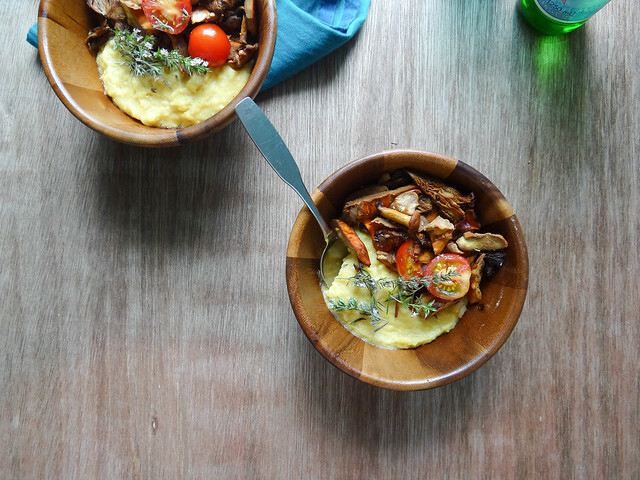 Divide the polenta between two bowls topping each bowl with the mushrooms and tomatoes- garnish with additional fresh thyme. i LOVE polenta but haven't eaten it all summer. thank you for reminding me to bring it back! 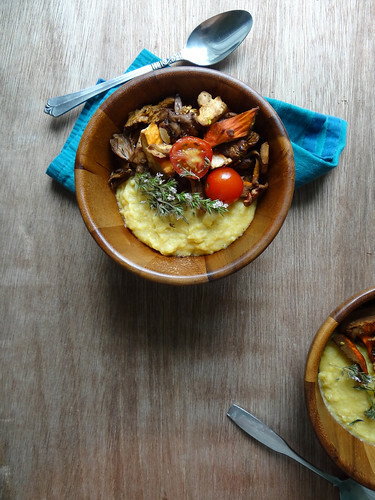 i love the pairing of polenta and mushrooms. 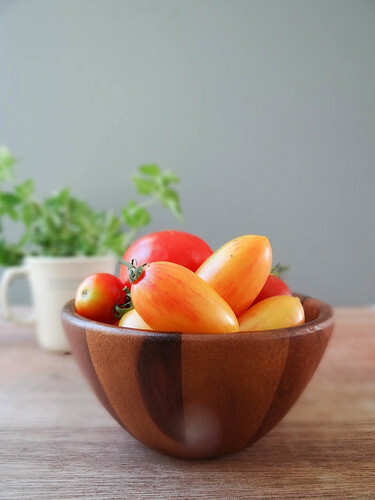 this bowl looks awesome! 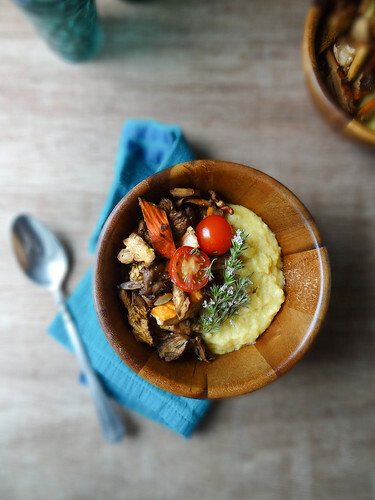 Polenta is so perfect for the fall! 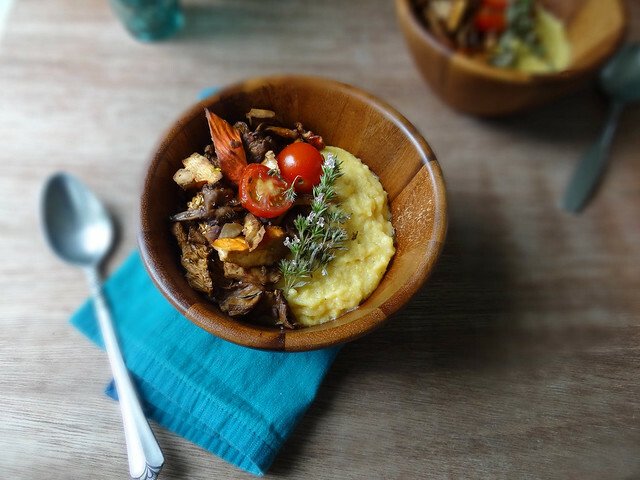 I am wondering if I ever had polenta... ;) maybe not. I'll check if it's gluten free. This is such a pretty meal. I'd feel like a total princess eating this! It's so colourful! 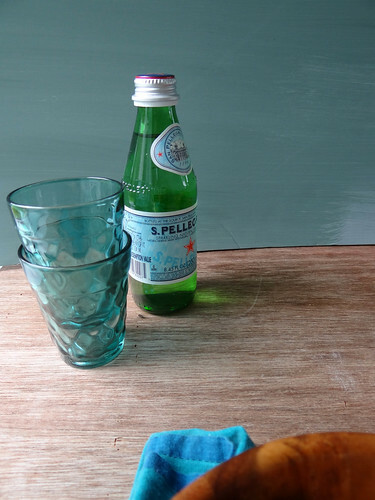 It so easy, there are so many ways you can prepare it after it is made- I love it! Thank you for stopping by Shannon! I know it, it was love at first sight! I don't know if I've ever made a bowl of creamy polenta this way - I usually end up letting it firm up in the fridge and then baking it for a crispier version (like the fries you mentioned). I need to try this method though, especially with a big helping of warm balsamic veggies on top! Yum! 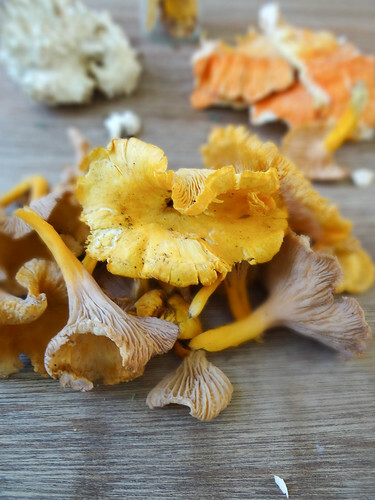 I was just in the forest in Norway picking chantarelle and some other goodies, and now they're just waiting for me to cook something with them. Oh man I am so jealous!